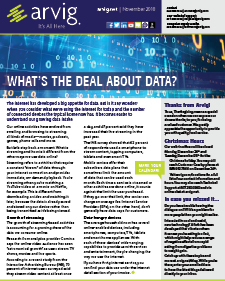 Arvig Newsletters | November 2018: What's The Deal About Data? November 2018: What’s The Deal About Data? The growth of streaming services has changed the way we use the internet. Our online activities have evolved from browsing and sending emails to streaming movies and TV episodes. Check out this month’s newsletter for more about the growth of data and the internet.